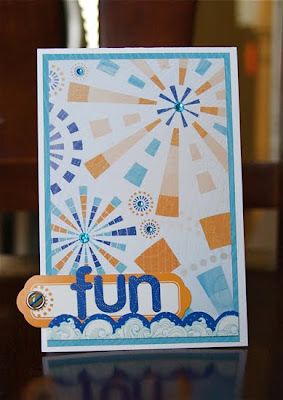 Product Showcase: Kaiser Craft Pennyroyale and Offshore lines with a GIVEAWAY! G'day Mates! This was said in my best Australian accent, which isn't great by the way. Today we have Kaiser Craft that is based out of Australia. I have to say that it is a pure delight going to their booth at CHA just to listen to them talk. I know, crazy Yankee that I am. However, I have been a huge fan of their rhinestones from the moment I found them. Since then, I have found their paper lines and additional embellishments a delight! So let's get started. I love their packaging. The embellishments, stamps, and rub ons come in these great resealable folders. They have hole punches on the side so that you can store them in a small binder. FABULOUS! What a great idea, especially for the stamps and rub ons. I really like the versatility their paper provides. 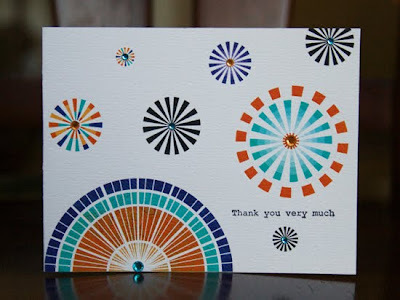 I am a card maker by trade, and I love small tight patterns for that reason. However, they have big and bold patterns for layouts and other projects as well. Lastly, I want to comment on their stamps and rub obs. I love them! The stamps have a real clean image and I get the same even image every time. Who doesn't love that?! The rubons are fabulous. They go on very well. Some rub ons are sticky and collect the debris that floats around your scrap room. These don't! To me that is a huge bonus! Great rub ons that go on perfectly. On the bottom of each patterned paper it lists the Bazzill cardstock matches!! The brads are pretty flimsy. All products are Kaiser Craft except much appreciated stamp and ticket on layout is Tim Holtz. All products Kaiser Craft except Thank You Very Much stamp. What do you think? Are you a fan of Kaiser? What are your likes or dislikes? Leave a comment by tomorrow at noon to be entered to win a great prize pack of the Pennyroyale line. Cheers!! I love Kaisercraft products, and these have raised their always high level! I have to say that Pennyroyale is just gorgeous! Love the colors and gotta love the bling! I have been a fan of Kaiser for about a year now. Glad I encouraged my LSS to carry the line. It has been very popular. I'm really not familiar with their products...that will have to change :) Would looove to win some! I must say Kaiser Craft has become one of my favorite brands. I have found paper after paper of theirs that are just must haves. I love the bright but not TOO bright colors. They have so many designs that are versatile but, also carry themed papers as well. Their papers are heavy weight but still very workable and overall I think they are one of the stars of the current scrapbook world. I like what I see :) This is a great giveaway--thanks!! Please pick me! I love this collection! You know, I have Kaiser Craft paper and I never noticed that it lists colors of Bazzill!! I gotta go check that out. Thanks! I've never used any of their papers, but I have envied them from afar. However I LOVE and own SOME of their rhinestones and other bling. I think the brads look adorable. I would use those puppies up! Love the bling these guys have. I would love to get my hands on some of their mini albums, very cool looking! Thanks for the reviews! Love those colors! Thanks for sharing! I've never used KC products, but I do love the look that I see here! I love KC chipboard home decor items to decorate but haven't used their papers before. They look gorgeous! Thanks for the review, I love your projects. I love Kaisercraft gems and pearls, but I've never had a chance to play with their papers. Thanks for the giveaway! Your cards and layouts show off the Kaiser lines very well! Great review. I am a big fan of Kaiser. I like their simple designs and fun details in all their products. I do not prefer lots of white backgound designs, (but do love it in the Offshore line). The Pennyroyale line is gorgeous and I would LOVE to be the winner of that GREAT prize pack. Thanks for the chance! Cheers!! Love KaiserKraft! They have some really great product - love their wooden stuff. I love their bling!! Love the colors in that collection! I don't think I've ever used anything by KaiserCraft. I haven't used Kaiser Craft stuff before.... but I'd sure like to based on what I've seen here! Both of these lines look awesome, but I really love Pennyroyale! Love Kaisercraft! Especially their bling! Thanks for the chance to win! I am a HUGE Kaiser Craft fan! I love their paper and embellies, but also just adore their alterable items! These are really nice! I have been loving their products! I love Kaisercraft!!! Its sad to hear the brads are a little flimsy, maybe they will take that into consideration for the future. Well, I love all things Aussie (since my hubby is half Australian) and Kaiser is no exception...love it!! Gorgeous designs. I love Kaisercraft! I only wish their products were easier to find. My most favorite paper right now is the most beautiful shades of purple and blue with fairies. I've been hording them since they came out and waiting for a really special way to make them into a project. I don't want to waste a scrap they're so beautiful. Ohh super cute! Whats not to love!!!!?? I am a big fan of Kaiser Craft, love their products! Both lines are absolutely beautiful and I couldn't have enough of them!! 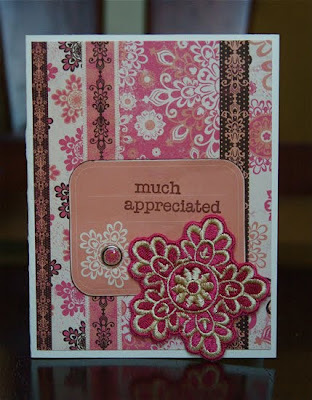 Your samples are awesome, Love all the bling on the off shore layouts and cards!!! Love, love, love their affordable pearls and rhinestones- I stock up every time I go to our LSS (even though by local I mean 60 miles away). 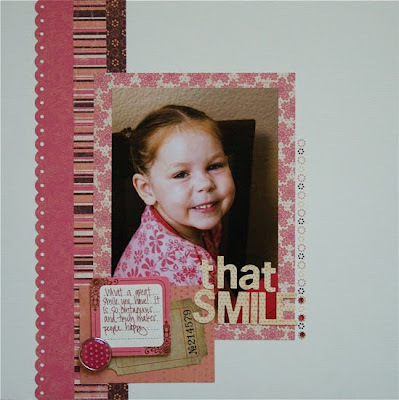 Thanks for sharing looks at their paper and other pretty products! I love there paper very nice quality. I think Kaisercraft has such a unique look. I'm creating some layouts with the Loire Valley line this week. Would love to have a chance to use Pennyroyale. Kaiser Craft is a pretty cool company. I like their products so far. I would love to receive the Pennyroyale line as that is one that I haven't gotten yet. I love the colors and design. In that respect, their designs are really hip and up to date. I love Kaisercraft rhinestones and their paper is great quality! I love them first for the embellies, second for their fab prices, and third for these super cute lines!!! Never tried their line, but I would love to!! Thanks for your review! I love Kaiser Crafts! Anything from "Down Under" works for me!!! I love their bling and can't live without their rub-ons. I've never used this line. But always looking for new stuff. And what gal doesn't enjoy a great stamp & awesome rub ons? I'm a huge fan of Kaisercraft-I even participated in their 30 days event on their blog - they have great product for a decent price! 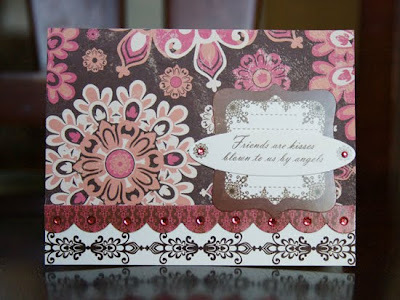 Kaisercraft has fabulous patterned papers, and as Ashley said their embellishments are fab! You get sooooo many flowers in one pack - they last forever! The Pennyroyale line is beautiful - I <3 pink and brown! Oh my! That Pennyroyale is a WOW! set. I wuld love to win but if I don't, thanks for listing where I can get Kaiser Craft. I had some Kaiser stuff in a kit I used last year. Can't remember what it was, just remember that I LOVED it. Thanks for a chance to win. I am in love with the colors, very beautiful! Love your creations and would love to try these products they look great!!! This is a beautiful line, and I can see using the Pennyroyale line for Christmas! Thanks for the review, otherwise I would never had known it was out there! I love KC!!!! Their new lines look gorgeous and you did a wonderful job working with them! I have always wanted to try Kaiserkraft but no one near me sells the papers. :( I am in love with the pink line!!!! I really like KaiserCraft---especially the shape scrapbooks. I haven't ever seen products by Kaiser, but I would love to try some out! Great projects! 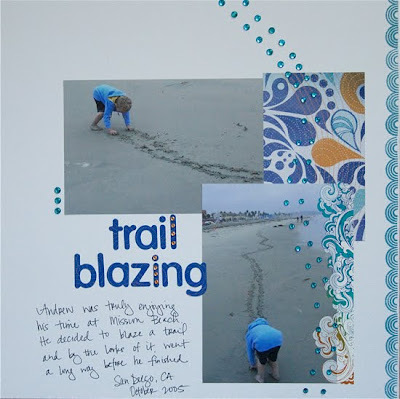 I love how you used the rhinestones on your Trail Blazing LO! I LOVE KaiserCraft. Love love love them! Sadly, all I have are a ton of the rhinestones; would love to win some other goodies! I love Kaiser Craft..... lots of fun embellishments and cool papers. Tahanks for a chance to win some goodies! I have always enjoyed Kaiser Craft papers when I have found them. I really love their website and all the free downloads. They are very scrapper friendly. I haven't seen Kaiser products before. They look like something I'd enjoy using to scrap with. Thanks for the chance to win! The Kaiser items are beautiful! Thanks for the introuction. I love Kaisercraft pearls! I'd love to try other products. I have become a huge fan over the past year. I love their mini albums, they have such fun shapes! I haven't tried the Kaiser craft yet. Maybe it will be my lucky day & I will get to! I'm not that familiar with Kaiser, but that line looks delish! I really like all their rhinestones and rub-ons. Great prices, colors and designs. I don't know if I should admit that I am not very familiar w/ Kaisercraft's lines. :0} I love the Pennyryale line that you showed us though! Great projects -- love the colors. I love Kaiser Craft's designs. I would so love to win some of Offshore. Perfect patterns for beach and pool layouts. They have some great designers. Thanks for the chance to win! The PennyRoyale line has such a rich and pretty palette. I love reading the product reviews. Thanks for the chance. I really like Kaiser Craft products. I found them years ago from a Australian seller on Ebay. I love their stick on rinestones. They have so many colors available. The Pennyroyale line is beautiful. I love the colors! 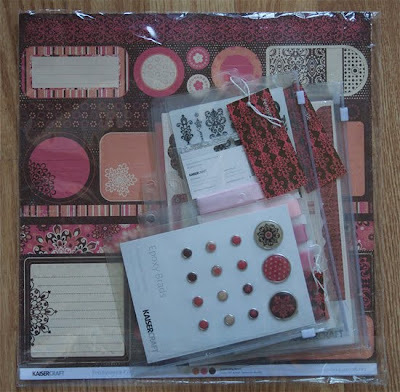 WOW - I havent seen Kaisercraft stuff in any of my local stores but would LOVE to try out there beautiful products!!!!! I sure hope I get lucky. I love the projects shared!!! I loved Kaisercraft pearls for a long time, I didnt know they made stamps too, but I'll definitely be checking those out. And thanks for the review of the rub ons. I dont buy rub ons unless someone says they're good because I have found so many duds. I have not had the opportunity to try their products so I would love to win the get the opportunity! Love the colours in the Pennyroyale collection! Love Kaisercraft - quite funny I had just loaded an Offshore project into their Gallery when I saw this comp. I love kaisercraft especially their off the page range. Have to say-I LOVE this company-I just wish more of my local stores carried more than the bling-I've seen that they have started with the stamps anad rub ons both of which I'm also addicted too-but I haven;t gotten to try them yet! I too love Kaiser craft products and would you believe I live about half an hours drive from their factory and outlet store and yet I have never been there! It's on my to do list with a million other things. I especially love their bling which is so reasonably priced and have even used it on my 6yo daughters shoes!!! Sadly I haven't seen any of their lines at the LSS. I think they are awesome. I love how they have so many pieces that match.